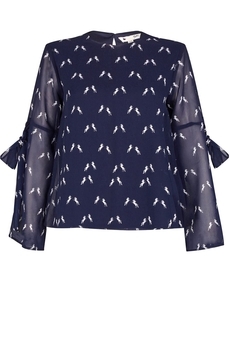 Yumi London, Unicorn Flute Sleeve blouse will update your look instantly with the on-trend flute and self-tie ribbon detailed sleeves. Featuring cropped length, A-line loose fit and pretty unicorn print design on semi-sheer fluid light-weight fabric. Has a teardrop cut with button at the back, it is fully lined and is approx. 58cm in length. Composition: 100% Polyester. Color: Navy.